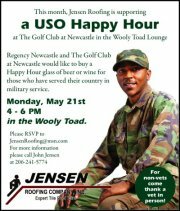 Regency Newcastle Senior Living Center and The Golf Club at Newcastle sponsor a “Happy Hour” for Veterans. All are welcome, but we buy a couple of drinks for the Vets! If you are a Vet, you are welcome, let us know what branch and vehicle, boat, ship, plane, copter or IKEA desk you used during your service! If you support and appreciate our veterans you are welcome to come and thank one! Vets from WW2 to Afghanistan will be in attendance. Previous PostPost Meeting Tonight!! !Next PostHappy Armed Forces Day!! !